It's apparent at this point that if you've found yourself reading today's post that you, like me, are an avid New Era Cap fan. You probably wear one every day, know all about the teams on the front of them, and even where they are produced (It's Derby, New York, if you weren't sure). That being said, the great people at New Era are offering an opportunity to witness the making of their ever popular 59Fifty fitted cap. This upcoming Thursday, July 26 at 10 A.M., New Era is letting you take a peak at the process which results in something near and dear to us. 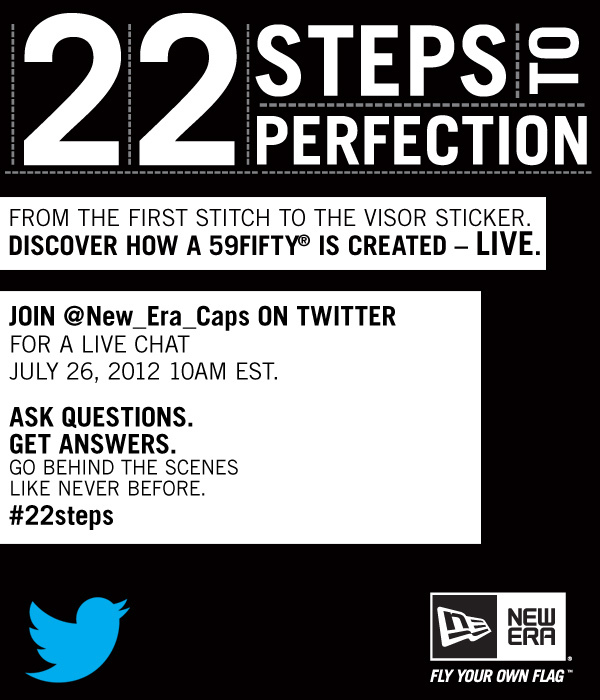 This LIVE chat, which will be conducted on Twitter through their official account @New_Era_Caps , will give you a chance to have all your questions answered in regards to the 22 step process to perfection. 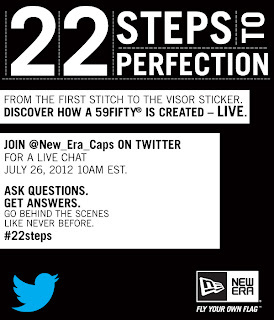 Remember to use #22steps leading up to and during the chat to spread the word about this unique experience. Enjoy, Everyone. Hopefully this will make the ever-long work week go a little quicker.